Even the most prestigious of professions can’t escape from the gender wage gap. It’s been known for years that female doctors earn less, on average, than male doctors. However, a new study reveals some of the reasons insurance companies and Medicare, the government’s program for people 65 and older, pays its male doctors nearly 88 percent more on average than their female counter parts. Researchers at Nerd Wallet analyzed newly released Medicare physician payment data and found that Medicare paid its male doctors an average $118,782 a year in reimbursements, while female doctors received an average of just $63,346 a year from the federal program— a difference of more than $55,000. Though the Nerd Wallet study cautions that Medicare reimbursements are just a component of a physician’s salary, there are a number of factors at play. The study broke up the data to explain the inconsistencies in the way Medicare pays its doctors and the way medicine is practiced. Authors of the report make clear that the data is not suggesting that one gender practices better medicine or provides better services that the other. Instead, it suggests there are a number of trends between the genders including the specialties they choose and the hours they work. 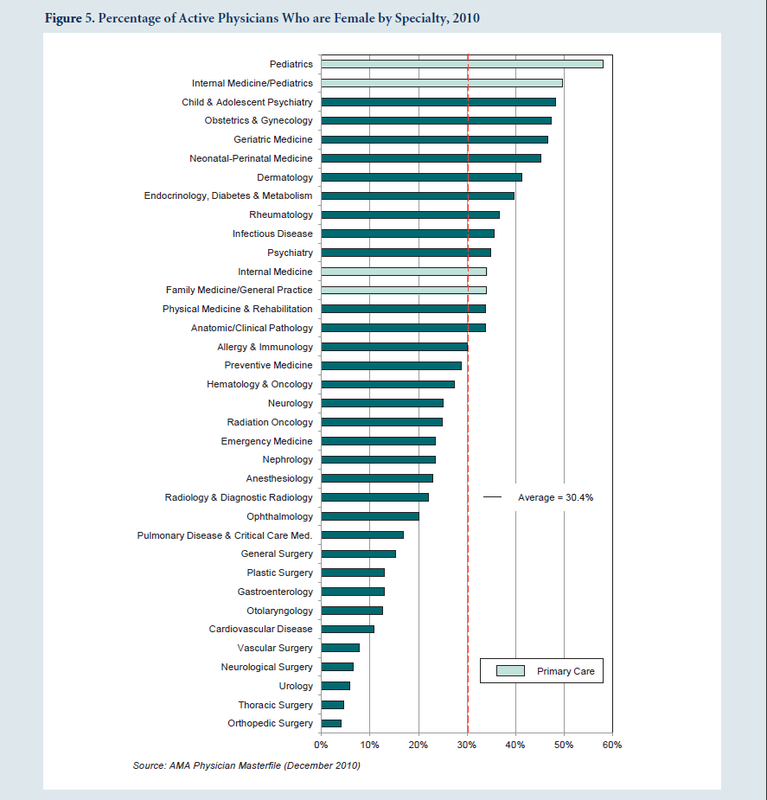 For example, the highest paid medical doctors are surgeons, one area of specialty where few women apply. Male physicians also see 60 percent more patients than women, and they provide more services per patient treated than female doctors across nearly all specialties. “We found that male doctors billed Medicare, on average, for one more procedure per patient than female physicians,” the study said. The good news is that the overall income gap between male and female doctors is narrowing. A separate analysis by Web MD shows male doctors earned 40 percent more than females in 2010. That dropped to 30 percent in 2013. Among primary care physicians, the gap is narrower—men earned about 13 percent more than women in 2013. Among family practitioners, men earned 19 percent more. Still, a separate analysis found that women tend to be just as satisfied as men with their compensation. The study looked at Ob/Gyns and found that 47 percent of women were satisfied with their average earnings of $229,000, compared to 38 percent of men satisfied with their average pay of $256,000. Aside from practice variation between men and women, the analysis also suggests there are several other factors that could explain the gender pay gap, including geography. For instance, females could be more likely to serve in lower paying zip codes, another reason could be coding variation-which means men could be performing more highly reimbursed procedures than female doctors. This article was updated at 12:35 p.m. on Wednesday, April 23.